The No. 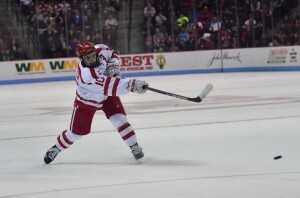 9 Boston University men’s hockey team outlasted the University of Massachusetts Amherst on Saturday in game two of the opening round of the Hockey East Tournament to advance to the quarterfinals. 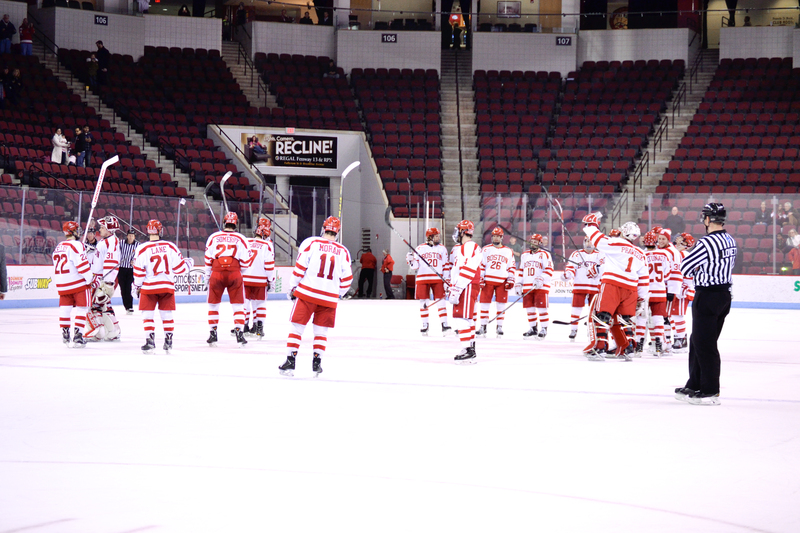 The Terriers (21-10-5) defeated the Minutemen (8-24-4) at Agganis Arena by a score of 5-4 and will next take on the No. 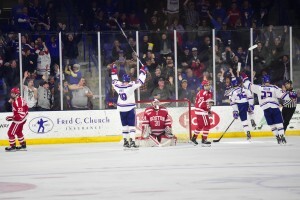 11 University of Massachusetts Lowell beginning Friday night at the Tsongas Center. It was a back-and-forth game Saturday and BU took the lead five times and only held it once, allowing UMass to tie things up again and again. The inability to gain more than a one-goal edge was “a testament to UMass and how hard they played,” according to BU head coach David Quinn, but senior assistant captain Danny O’Regan said the Terriers also have a responsibility to learning how to build on a lead. After being held goalless in each of his games since Jan. 22, freshman center Jakob Forsbacka Karlsson netted the game-opener and game-winning goals against UMass. Nick has more about that and JFK’s progress in his sider. In their last games at Agganis Arena, O’Regan and senior captain Matt Grzelcyk combined for a total of six points. O’Regan collected a pair of goals and a couple assists for four points while Grzelcyk tallied a goal and a helper as well as being on the ice for every Terrier goal. O’Regan now has three multipoint games over his past half-dozen and is the 18th player in program history to register at least 150 points over the course of his BU career. Quinn also spoke highly of O’Regan’s season and said his best hockey has come in the past six weeks, but O’Regan himself was pretty quick to credit his teammates for his success. And as O’Regan’s points pushed him over a plateau, Grzelcyk is approaching a milestone as well. The defenseman’s two points on Saturday gave him 93 for his tenure at BU and he’ll have a chance to inch his way closer to 100 beginning Friday. Quinn pointed out that both O’Regan and Grzelcyk had chances to leave BU to try and start their pro careers, but decided to come back to complete their senior seasons. “I think if you talked to both of them, they’re really happy they came back,” he said. Freshman defenseman Charlie McAvoy had quite a game as well Saturday night with four assists. He was also on the ice with his defensive partner, Grzelcyk, for each BU marker. McAvoy said being more of a puck-mover and less of a puck-lugger is something that Quinn has emphasized to him and something he’s been concentrating on. Right before this game got started, the BU women’s hockey team had just finished its Hockey East Semifinal matchup against No. 6 Northeastern University. The Terriers pulled off a 4-3 upset with goals from sophomore forwards Rebecca Leslie and Victoria Bach as well as senior captain Kayla Tutino and senior defenseman Alexis Crossley, who had the game-winner. At the other end of the ice, sophomore goaltender Erin O’Neil recorded a career-high 54 saves to keep BU on the winning side of things. The Terriers now move on to play No. 1 BC on Sunday in the Hockey East title game for a chance to capture their fifth straight conference championship. At least in the first 40 minutes of the game, penalties proved to be a problem for BU. The Terriers committed seven infractions, conceded 11 power-play shots and allowed the Minutemen to capitalize on one man-advantage for their third goal of the game. Senior forward Ahti Oksanen even picked up a game misconduct, which Quinn noted sort of indicated the team’s mental state during the game and series. He said winning the contest wasn’t easy, and while a lot of it had to do with how hard and well UMass played, a portion of it was on BU. Of all the things BU could improve on heading into next week’s game, defensive coverage is probably the one that stands out most of all. Forsbacka Karlsson said the team wasn’t sharp enough defensively, in Friday or Saturday’s game, and McAvoy added that “there are a few goals [they] would have liked to have back.” Going forward, the blue liner continued, everyone needs to make sure they have their man in the defensive zone and that they’re boxing guys out on rebounds and are always in front of the net. Saturday was the last game of the season at Agganis Arena, but it was also mine and Sarah’s last games here as students, too. My first was BU’s 4-2 win over Providence on Oct. 13, 2012, and I’ve seen close to 80 games here since then. It’s kind of surreal that I’m never going to be back at this rink in that regard, and I’m certainly going to miss it tremendously. I know Sarah feels the same as well. Luckily for us, though, our graduation will be in this building in a couple months, and we have more hockey to cover, so we’ll be around! LOWELL — You’ve probably seen the score by now, but on Saturday night, the No. 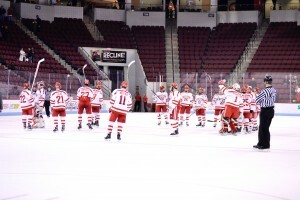 7 Boston University men’s hockey team fell to the No. 11 University of Massachusetts Lowell by a score of 6-3 at the Tsongas Center. It was not pretty. At all. The Terriers (17-9-4, 10-5-3 Hockey East) made mistake after mistake, and the River Hawks (18-7-5, 11-5-4 Hockey East) made them pay for basically every one of them. Teams and players are going to make mistakes during games. Obviously. No one plays a perfect game, but generally those mistakes don’t always find their way into the back of the net. On Saturday, Quinn said, that’s what it felt like happened. The River Hawks struck first on defenseman Dylan Zink’s first of three goals on the night 11:26 into the first period, and the Terriers responded fairly quickly. Freshman center Bobo Carpenter knotted things up 1:36 later. From there, though, it wasn’t so close. “We give up a faceoff goal, completely blown coverage, as simple as coverage you can have in hockey,” Quinn said. “A horrible goalie-D exchange,” he said. And then the sixth was the fruits of a solid netfront, batted-out-of-midair tally from Lowell captain A.J. White. Though the final result and score are definitely not ideal, Quinn noted they aren’t necessarily symptomatic of the overall defensive play. Andrew has an additional perspective on this in his sidebar. It was another 0-fer night for BU’s power play as the Terriers failed to convert on a trio of opportunities with the man advantage Saturday night. While the team began the year with a relatively prolific power play, things have certainly dropped off in the last handful of games. Since they went 3-for-6 on the power play during Jan. 15th’s loss to No. 3 Boston College, the Terriers are an anemic 3-for-30 with the man advantage over their last nine games. One of those goals came in the form of Friday’s overtime winner, but not much has been doing for BU. The Terriers have been slow while operating in the attacking zone with the extra skater and aren’t doing enough to get the penalty killers out of sorts. 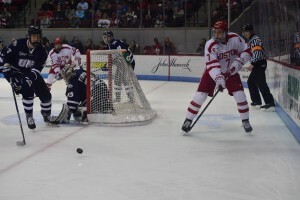 Excessive stickhandling and messy entries have allowed opposing units to set up and adjust to each move BU makes, preventing the Terriers from getting anywhere close to capitalizing. Typically, teams that are trailing are going to play more aggressively because, well, they’re trying to score goals. On the other hand, a team with a fairly safe lead like Lowell’s four-goal edge, can afford to play more conservatively. The objective would be to maintain the lead, not necessarily to add another goal. “I thought we played well as the game went on, but tough to gauge because, like I said, when it’s 5-2, they’re playing a little bit different,” Quinn said. I’ll admit I’m kind of scraping the bottom of the barrel here, but I wanted to give credit to Ahti Oksanen, who had a pair of primary assists in BU’s loss Saturday. The two helpers served as the senior’s sixth multi-point game in the second half, and he is now tied for 20th in the country in scoring with 33 points. 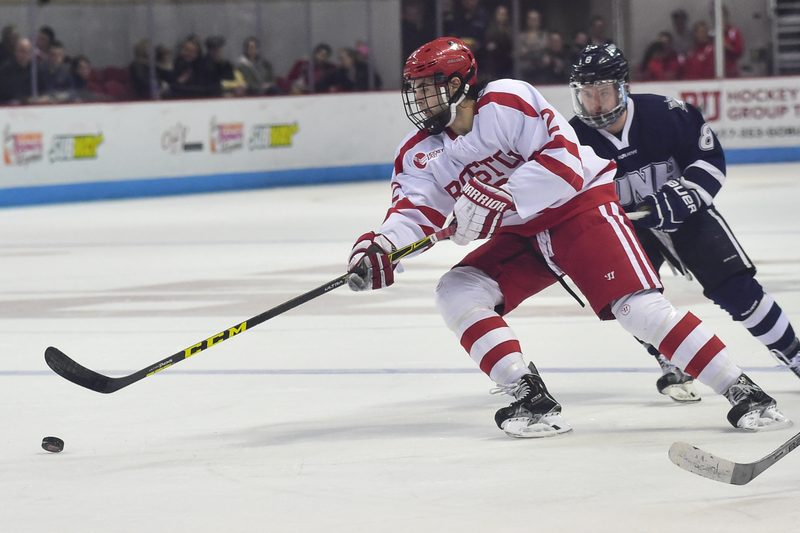 Since the Terriers have returned from break, Oksanen has five goals and 12 assists for 17 points in a dozen games. For the second straight game, the No. 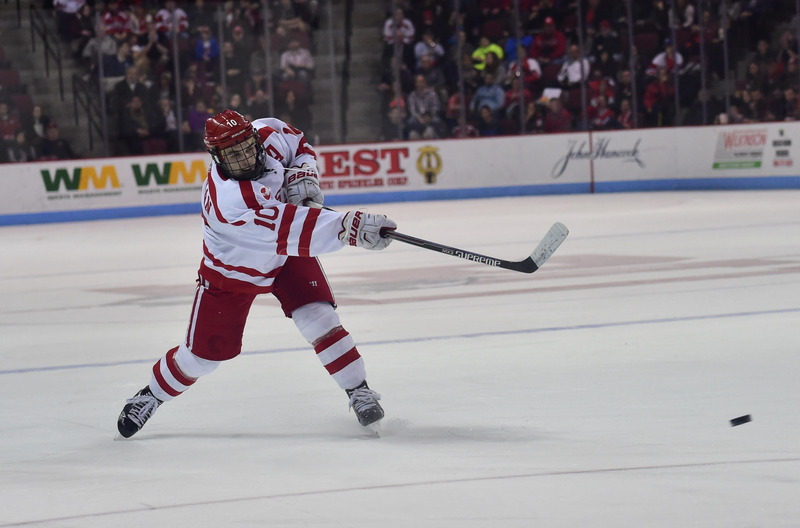 7 Boston University men’s hockey team faced one of the nation’s best defenses, and for the second straight game, BU was trapped in a close game — and the game got sent to overtime. Against No. 3 Boston College in Monday’s Beanpot final, the Terriers didn’t have such great luck. This time, though, against the No. 11 University of Massachusetts Lowell on Friday at Agganis Arena, freshman forward Jordan Greenway scored just 29 seconds into overtime to give BU a 2-1 win. Senior forward Mike Moran had a breakaway goal in the second period to give BU a 1-0 lead at the time — obviously, a crucial moment in a very, very tight game. Judy has more on that goal and his recent play in her sidebar. We tend to give a lot of love to Greenway and senior goaltender Sean Maguire in our pluses and minuses, and won’t go too much in depth this time around, but given how big they were in this game, we couldn’t go without giving them a shoutout. Greenway had the game-winner on a redirection of senior captain Matt Grzelcyk’s initial shot in overtime, making for his third goal in three games. Maguire, meanwhile, had 25 saves and earned the win. He lowered his goals-against average on the season to 2.12 and raised his save percentage to .929. BU only committed three penalties in the game: two on freshman defenseman Charlie McAvoy, the first of which was a somewhat questionable holding call, and a roughing call on Greenway. The Terriers entered the game averaging 5.1 penalties and 11.2 penalty minutes per game — certainly an improvement against a team where there’s very little margin for error. It’s no question that these final Hockey East series are crucial for BU, which currently sits in fifth place in Hockey East. The win gave them 23 points in conference play, just one point behind fourth-place Lowell. 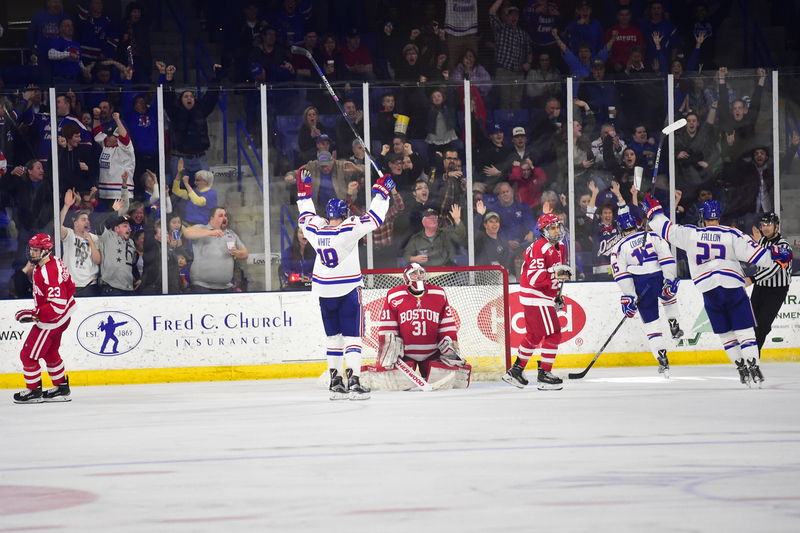 The top four teams receive home ice in the conference tournament and a first-round bye. And in the final three weeks of the regular season, BU has games against two of those teams trying to cling on to a first-round bye: Lowell, and the first-place University of Notre Dame. In a game as tight as this one, every goal counts, and despite holding the lead until the later half of the third period, BU surrendered a goal with 7:29 remaining in the game. On the play, Maguire skated behind his goal and looked to dump off the puck to one of his defensemen, but neither sophomore John MacLeod nor junior Doyle Somerby fetched it. Maguire scrambled back, and stopped the initial shot from Dmowski, but couldn’t stop the rebound shot from Lowell captain A.J. White. MacLeod was the closest defenseman who could have picked up the rebound and cleared it, but he failed to do so. MacLeod had a relatively strong game defensively otherwise, and had some noticeable chances on offense, but this wasn’t his finest moment, to say the least. “We haven’t talked about it yet, but we’ll certainly have to clean that up a little bit,” Quinn said. When we talked to Quinn on Thursday, and asked if there would be any line changes, he didn’t give any specifics, but indicated that we could be surprised on Friday. And hoo boy, were we surprised. There was a complete remodel of the third line on the line charts we were given: Moran played left wing with freshman Ryan Cloonan at center, and usual freshman center Bobo Carpenter moving over to right wing. Junior Robbie Baillargeon centered the fourth line between junior Tommy Kelley and sophomore Chase Phelps. But that didn’t last long. By our unofficial count, the experiment only lasted two or three shifts. Before long, Cloonan was back on the first line — where freshman Oskar Andrén started the past five games — and Moran was back down to the fourth line. Baillargeon moved back to his usual spot on the third-line wing, with Andrén on the other wing and Carpenter centering. That’s a bit of a mouthful, but tl,dr: As far as we could see, for most of the game, the lines looked like they did a few weeks ago in this game. “It was a quick experiment, and we didn’t like it,” Quinn said. “So we went back to it, made a few changes, and pretty much stuck with it. Hard to be too nitpicky on this, but worth noting: BU had a 4-on-3 opportunity for 1:46 in the second period, after Greenway and River Hawks defenseman Tyler Mueller were sent off for matching roughing penalties and Lowell defenseman Dylan Zink was sent off 14 seconds later for a hooking penalty. That 4-on-3 chance didn’t amount to anything goal-wise, which Quinn addressed in the postgame press conference.